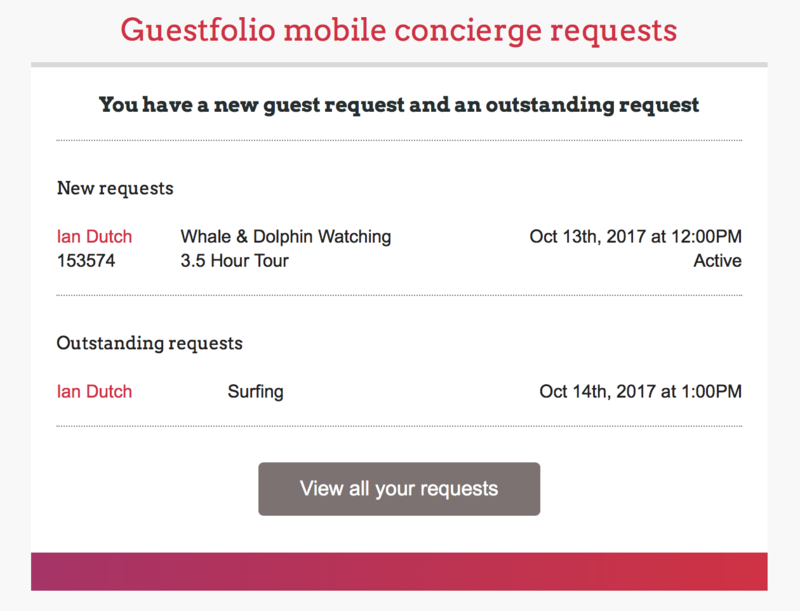 Requests that a guest makes through your Mobile Concierge are stored in your account Dashboard. If you wish to be notified of requests as they occur we recommend you enable the Guest Request report. 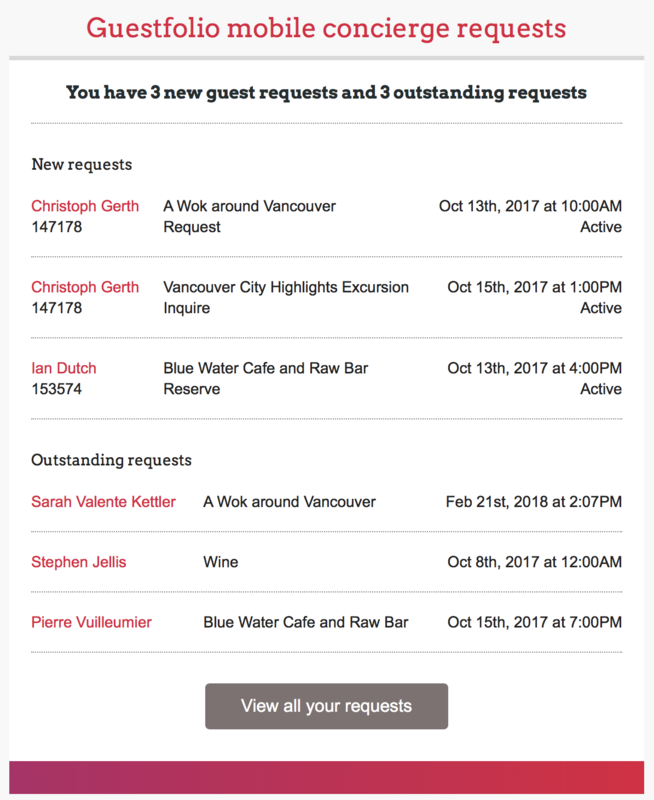 Each specific guest request is set up to be emailed to an email address of your hotel's choosing, for example spa requests might go to your spa, and restaurant requests to a restaurant email address. Please contact support@guestfolio.com for a list of which email addresses your requests are going to. As such, turning on the request report for a specific user will only work if they are setup to receive that request type. 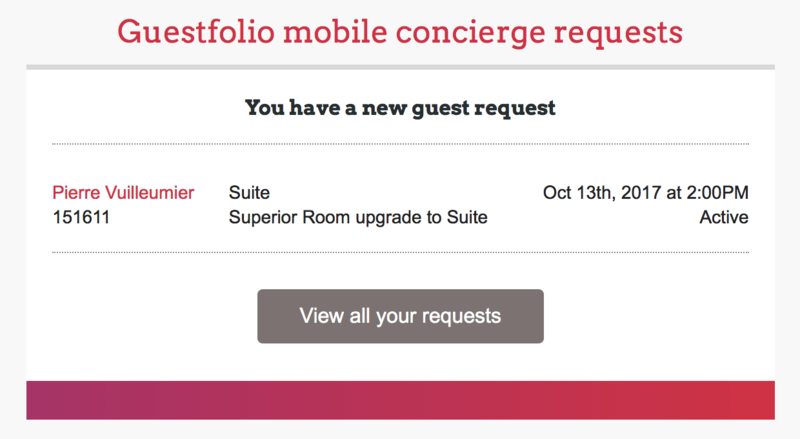 This will send the user a single email alert for any new request made through the mobile concierge. Screenshot example of Immediate report type. This option has an additional frequency setting which will determine how often the request report is generated. If there have been any new requests within the frequency time period, they will be collated into one email and sent to the user. This report will additionally include any other unconfirmed guest requests. Screenshot example of Aggregated report type. This option has an additional frequency setting which will determine how often the request report is generated. If there have been any new requests within the frequency time period, the user will receive an email report for each reservation with new requests. The email report will include any new requests and all other existing requests for this reservation. All users will always receive an email at approximately 6am local time including all existing unconfirmed guest requests. Screenshot example of Itinerary report type.